Musical boxes are best known for their kitschy designs and somewhat trivial renditions of musical masterpieces. They tend to frequent the dresser of young girls or elderly woman hanging on to their youth, and for the most part, they remain cutesy and harmless, but when featured in movies like The Silence of the Lambs and Black Swan, they become downright creepy. Aside from the innocent and eerie innuendos, a music box doesn't have to conform to the standards. For instance, you can ditch the complex comb and cylinders of those windup mechanical music boxes and replace them with the advanced digital music technology of today, so you can play any of your favorite tunes—not just the standard classical composers. Matt Richardson of MAKE Magazine has done just that, using an old cigar box and a cheap, miniature MP3 player—an iPod Shuffle knockoff. There's a on/off switch on the side, that when turned on, automatically starts playing the loaded music. "When I opened it up, I was delighted to see that I could easily stop and start the music by opening and closing the circuit between the battery and the MP3 player's circuit board. 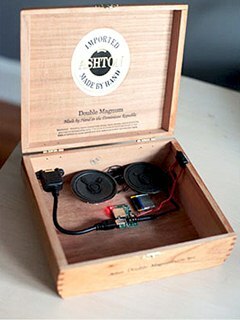 "Using a snap action switch inside a cigar box, I was able to control the music by opening and closing the lid, just like with a mechanical music box. The main difference being that my MP3 player would start the song over again after closing and reopening the box, which didn't bother me. I found a pair of cheap speakers that had a headphone jack so that I could easily plug them into the MP3 player. "I wanted to be able to access the MP3 player as a data drive and charge it up without awkwardly plugging a cable into the MP3 player directly, so I added a panel mount female USB B jack to the back of the box and plugged it into the MP3 player inside the box. Loading songs into the music box becomes a cinch when you just plug the USB cable from your computer into the back of the box and then drag the files to the drive." This masterful homemade MP3 music box makes for the perfect gift—for anyone—even a gamer! 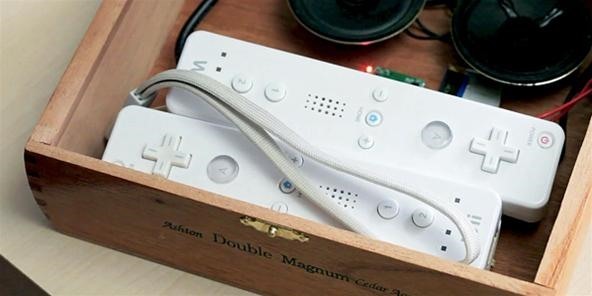 Check out the end of the video to see what Matt turned his music box into—a Wii Remote holder, playing his favorite Nintendo tune. Nice.